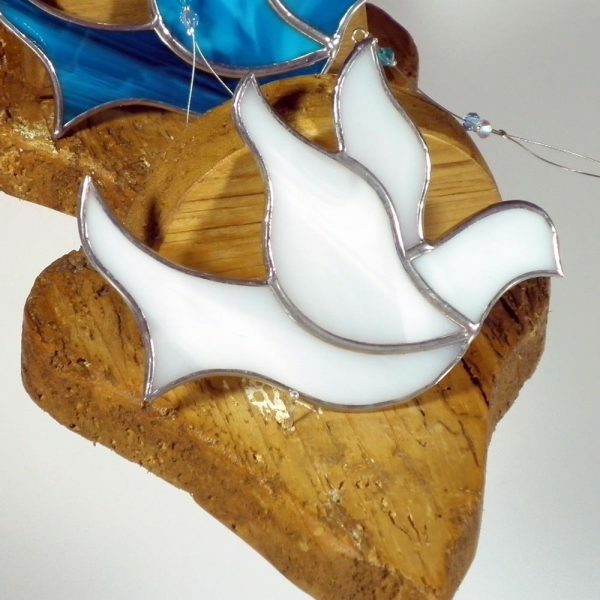 This Dove of Peace is a beautiful handmade White Dove Stained Glass Gift. Can be used as a wall decoration, but looks really stunning as a window ornament when the light shines through. The dove represents peace, grace and purity. In the Sacrament of Confirmation the dove is a symbol of the peace bestowed by the Holy Spirit. This beautiful White Dove Stained Glass Gift is designed and handmade by Magdalena and Daniel Dubaj, Ard aLume Stained Glass Studio, in Ballinrobe, Co. Mayo. This Irish gift has been lovingly handmade with great attention to detail, using the Tiffany method from high quality stained glass. Hung by strong tiger tail wire with three tiny Swarovski beads, colours of which compliment the stained glass of the white dove. The solder is a mixture of lead and tin, each piece is polished well for an extra shine. These little dove gifts have wonderful white coloured stained glass, which look particularly amazing when light shines through. Beautiful gifts handmade with love and care in Ireland. A truly lovely Irish gift in pretty packaging of plastic on black card and with raffia ribbon. Each White Dove Stained Glass Gift is individually handmade and is unique due to the natural variations in each piece of glass. Click here to view our full range of Irish Stained Glass Gifts, handmade in Ireland.